Figure 1: Scanned image of Beta Catenin (Green) and loading control alpha-tubulin (Red) Western blot using LI-COR Odyssey Infrared Technology. First lane, protein molecular weight markers. Second lane, SK-BR-3 negative control lysate. Third lane, MCF-7 positive control lysate. 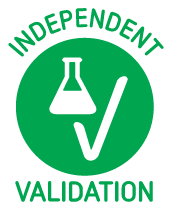 Read validation report #029816 for application Western Blotting. 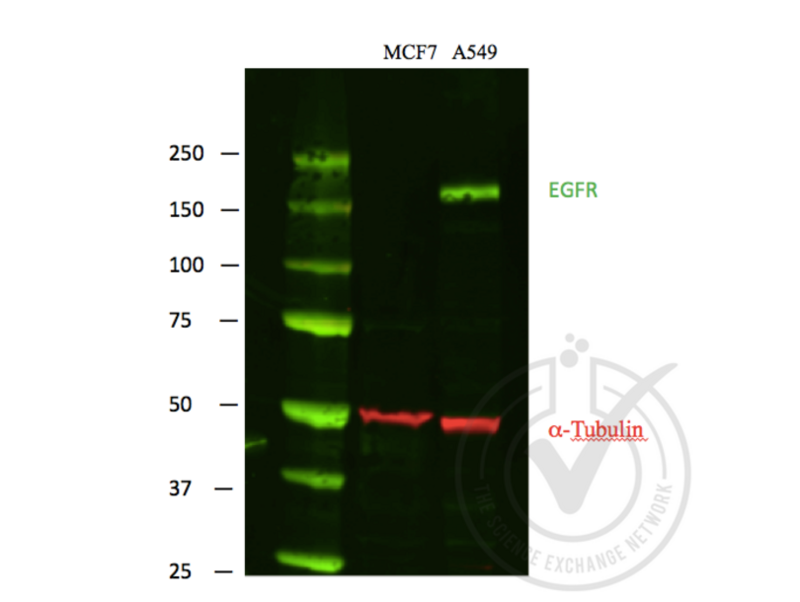 Figure 1: Scanned image of EGFR (Green) and loading control alpha-tubulin (Red) Western blot using LI-COR Odyssey Infrared Technology. First lane, protein molecular weight markers. 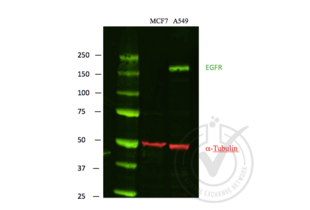 Second lane, MCF-7 negative control lysate. Third lane, A549 positive control lysate. 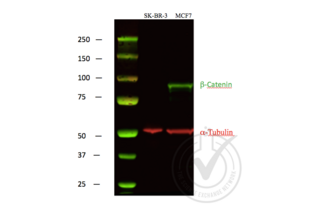 Read validation report #029817 for application Western Blotting. Notes A strong specific band was observed in the positive control at the expected size (~85.5 kDa) that is not observed in the negative control. Lysates were mixed with NuPAGE® LDS Sample Buffer (Life Technologies NP0007) and NuPAGE® Sample Reducing Agent (Life Technologies NP0004) and denatured for 5 minutes at 90ºC. 40 μg of each lysate was electrophoresed on a Bolt 4-12% Bis-Tris Gel (Life Technologies BG04120BOX) and run in Bolt MOPS SDS Running Buffer (Life Technologies B0001) at 160 volts for 1 hour. Odyssey Western Protein Standard (LI-COR #928-40000) was run as a molecular weight standard. PVDF membrane was activated with methanol. Protein samples were transferred to activated PVDF membrane in a wet Bolt Transfer Apparatus (Life Technologies B1000) at room temperature for 1 hour at 20 volts (started at 230mA, ended at 110mA). The membrane was blocked in x LI-COR Odyssey WB block solution for 1 hour at room temperature. The membrane was incubated with the primary antibody diluted 1:1000 in x LI-COR Odyssey WB block solution incubated 2 hours at room temperature. The membrane was washed 4 x 5 minutes in 1 x PBS-T (PBS solution with 0.1% Tween 20). 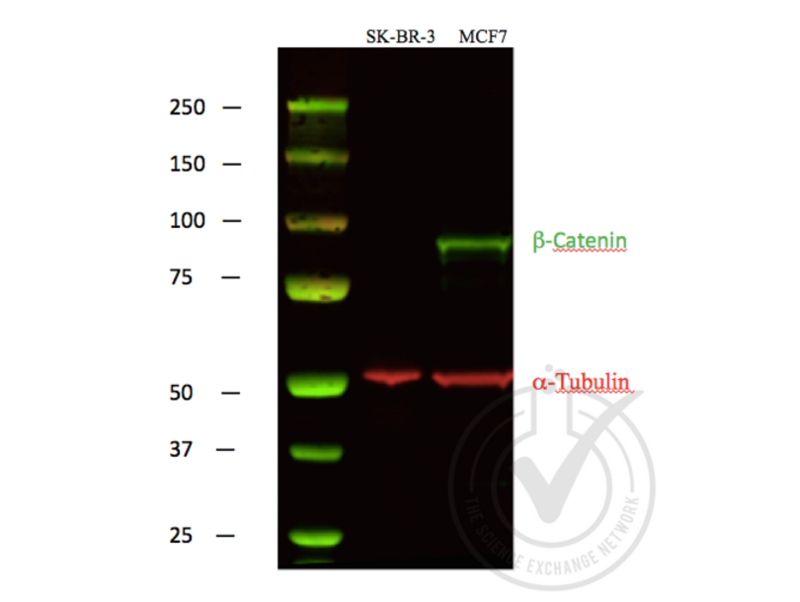 The membrane was incubated with IRDye® 800CW Goat anti-Mouse Secondary Antibody (Red) and IRDye 680LT Goat Anti-Rabbit Secondary Antibody (Green) from LI-COR (#827-11081, Lot #C30725-01), both 1:10,000 dilutions. Incubation was performed at room temperature for 45 minutes. Proteins were detected using Odyssey machine scanning with green channel for loading control and red channel for potential LPL band. Experimental Notes - No experimental challenges noted. Notes A strong specific band was observed in the positive control at the expected size (~175 kDa) that is not observed in the negative control.